The easiest way to take an attendee from a passive observer to an active participant is to have a robust mobile event app. A multi-day corporate event works like a machine with several moving parts. A seasoned event planner identifies each and every cog and weaves it together in perfect harmony. But when attendees aren’t connected to the big picture, it throws a wrench in the system, causing key messaging and the overall attendee experience to fall by the wayside. Mobile event apps provide the attendee experience blueprint to navigate and network while revealing interesting attendee behaviors for corporate event planners. These days, it’s rare to find an event that isn’t accompanied by an internal app. What determines its success isn’t just the amount of people downloading it, but how they interact with the app before, during and after the event. Event apps cut down thousands of dollars in overhead, but if you’re not utilizing the most innovative, useful features, they won’t deliver the ROI you want. Let’s review the event app features that help event planners extend the life span of an experience for their delegates. To state the obvious, scheduling helps keep attendees organized. But event schedules are no longer as set in stone as they once were. With the power of an event app, attendees can craft their own itinerary and decide who and what they want to see – making last minute changes and even programming in their own to-dos. Back in the day, show floor maps used to be flat, 2D visualizations with limited information. Take it a step further. Help users navigate the barrage of rooms and spaces with interactive maps that show where to find sessions, vendors and, of course, the food. Changes happen at the drop of a hat. When changing content on your mobile event app, you can send out useful alerts to attendees that keep them in the know. Aside from the inevitability of changes, push notifications provide useful alerts when a session or reception is about to start and also serve as a simple way to thank everyone for attending. We live in a data-driven world. An event app can provide real-time data like nothing else can. Track every touch in the app, look into how attendees are behaving and responding to the many facets of the event. Usage data helps form decisions for the next event or even make adjustments during an event, overall increasing opportunities to engage your participants. One of the greatest challenges everyone faces at events? Networking. Corporate event apps offer a unique solution for attendees and speakers to introduce themselves to the entire event community. Allowing users to create profiles makes networking for attendees extremely efficient and an easy way to break the ice. These profiles contain professional information which attendees can use to find the right people to network with. In-app messaging lets attendees search and message one another and arrange meetings or coffees during the event. Finally, an in-app activity stream promotes user-generated content allowing users to post ideas, photos and questions. Each of your revered speakers needs a punchy bio to help add legitimacy and thought leadership authority before they even step on stage. These offer users a useful glance into their background and give their networking efforts some direction. This is a great way to increase delegate participation. Be honest, during a presentation in a room of hundreds, will the whole room be engaged? Live polling gets the crowd involved in presentations and makes them feel included in the overall experience. Planners can also collect these surveys for feedback or segment the audience to survey specific groups. Your social media team will be hard at work on event day, but your attendees can be doing the heavy lifting for them. Sharing posts to personal social media pages lets users be your brand ambassadors by sharing their personal experience during an event. It sparks interest amongst the non-attendee and opens up a channel of communication around your brand. Impactful technology drives messaging and engagement in a memorable way. These trends push the envelope forward. Why spend money on personnel fielding FAQs when chatbots can do the work? Investing in chat technology for your event app will provide a convenient platform for attendees to ask FAQ’s regarding the event. Besides convenience, chatbots add another element of fun for attendees and data collection for the planners to the experience. Whether you like it or not, your phone is constantly transmitting radio signals. Understanding backend analytics, crafting key messaging and providing exclusive content offers a big advantage. According to Impact Mobile, proximity messaging through phones had an average click rate of 19% as opposed to 4.2% through emailing. Corporate event apps link numerous engagement elements to the experience and serve functionality and interactivity all in one place. They foster networking, participation, communication and data capture – the critical pillars any corporate event planner hopes to achieve! 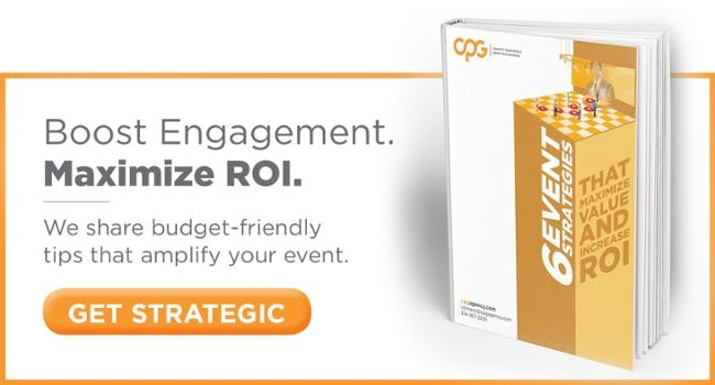 CPG can help you identify key features that keep your participants engaged at every stage of the event through the power of a mobile event app.